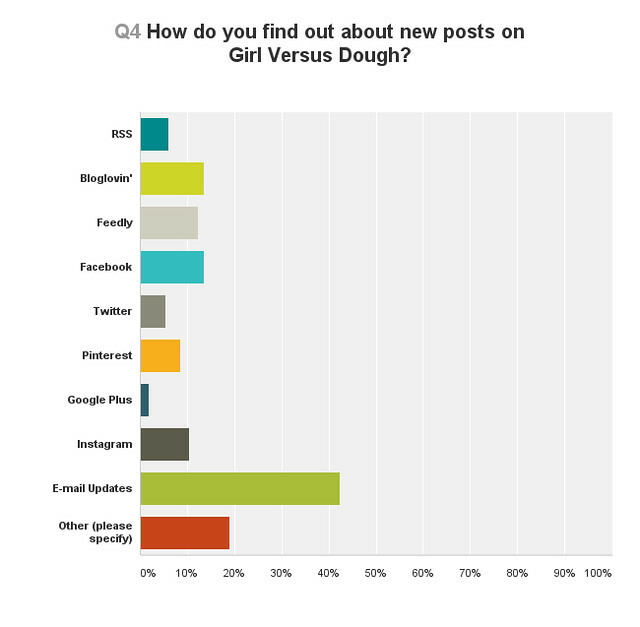 Most of you feel the frequency of posts is just right (and some of you want more!). I have always wanted to do more than two posts a week (but then came baby and, well, that went on the backburner along with showering every day), but knowing that you feel the current frequency is adequate is helpful. And for those of you who want more, I hear you — maybe one of these days I will be able to figure out a way to do it, because I want to. Until then, my focus is on quality rather than quantity, to deliver my very best content twice a week to you. Most of you also feel the frequency of sponsored posts and social media updates is just right (if you follow on social media). This is good to know. I try my best to make the sponsored content feel natural and not have the quantity get too out of hand, and I will continue to be conscious of that and how it affects you. The same goes for social media — I try to post as often as I can but not so much that you’re all “what the heyyyy my entire Instagram feed is pictures of carbs and Steph’s baby” and the like. So I’m glad we’re on the same page here. Also, if you don’t follow along on social media and would like to, you can find me on Pinterest, Instagram, Twitter, Facebook and Google Plus. For many of you, your biggest challenges in the kitchen are time and lack of space. Lawd! I hear you, as those are my exact. same. challenges. While I can’t really help you on the space part (unless we all rent one big communal kitchen somewhere together, in my dreamiest dreams), I can certainly take note of the fact that you’re looking for quick and easy meals, perhaps ones made with common kitchen tools (because we small kitchen spacers don’t have room for things like sous vide machines and popcorn poppers, amiright). Many of you are looking for more bread recipes (more carbs, hooray! 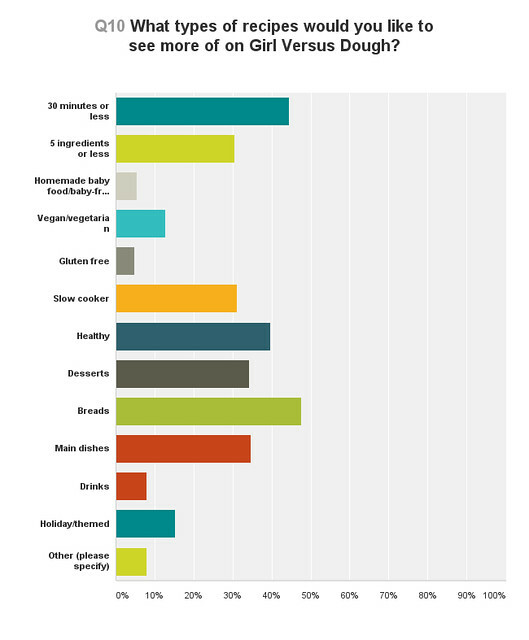 ), healthy food and 30-minute meals. A lot of you also mentioned as your biggest challenge in the kitchen that working with yeast and bread recipes in general intimidates you. Coupling that with the fact that most of you want more bread recipes on the blog, my hope this year and beyond is to feature more basic bread recipes with easy-to-follow instructions (kind of like my sourdough and croissant posts). I’m excited about this because I want all the peoples to be able to bake bread at home! You also are interested in healthy foods and 30-minute meals, and guess what? Me too. So let’s get more of those recipes on here in the future, as well. You also want more “how-to”/informational posts. This will kind of go hand-in-hand with featuring more basic bread recipes with easy-to-follow instructions as mentioned above. Many of you want to see video tutorials and a cookbook. I love this! I have always wanted to incorporate more video on the blog, so I will definitely try to make that happen this year. As for a cookbook, I would so, so love to do that — it’s still a dream of mine. But despite potential opportunities that have come my way, currently it’s just not the right time for me with a busy family life. One day, I hope! 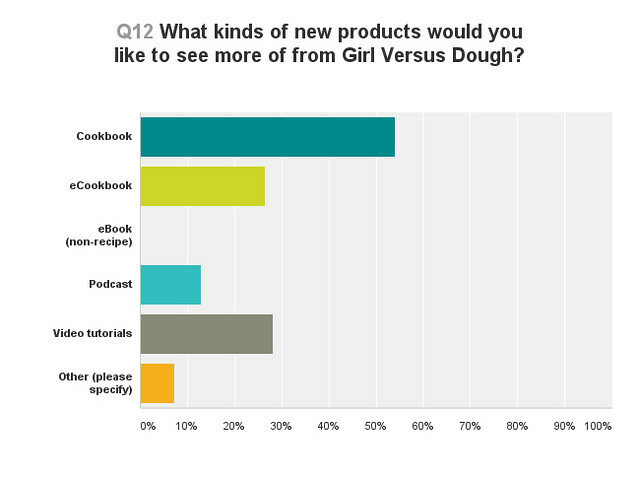 What do you love most about Girl Versus Dough? The writing, recipes and photos. 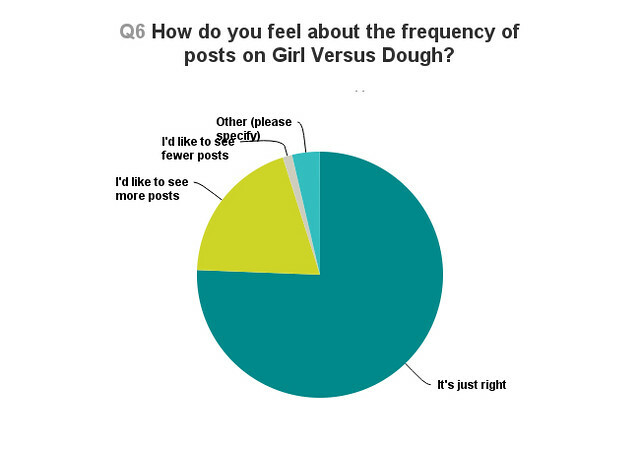 This was my favorite part of the survey to read because you all were so darn kind. It is so encouraging and uplifting to know that you enjoy being in this space with me as much as I do, whether it’s for the writing, the recipes or the photos. Seriously, I am just blown away by your kindness. Ugh, tears again. Garsh. 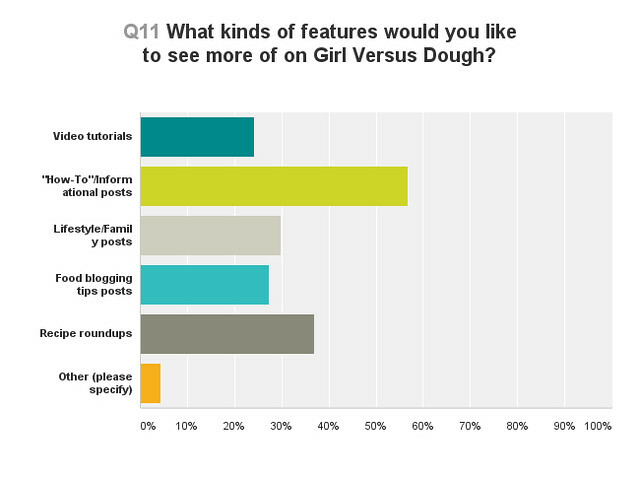 What do you love least about Girl Versus Dough? This response was a little all over the place (meaning there was no one clear answer), but some of you mentioned wanting more step by step photos in posts, more bread recipes and more posts in general. All things I hope to address from here on out. That covers most of it, so I’ll stop there before this post gets TOO epic (too late? Sorry. Have a cookie). Thank you all again so very much for your feedback — I am taking each and every comment to heart, and I am excited that together we can make this space more useful for everyone. 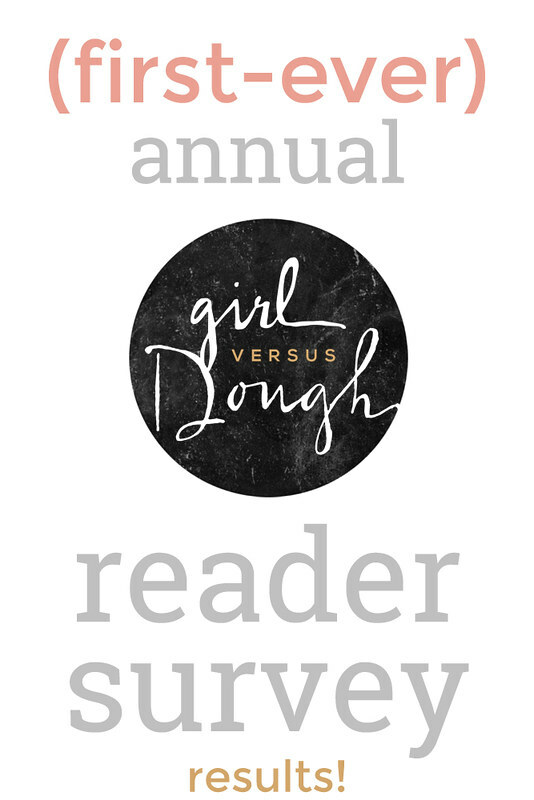 If you want to know more about the results (or the ones I didn’t mention here), please feel free to leave a comment below, e-mail me (girlversusdough@gmail.com) or message me on social media. Hearts and hugs, friends — and more carbs to come on Monday! I really want to do one of these! I’m sure it was super informative. This is so cool! I’ve really got to put one of these together. Awesome results!